Over the holidays this year I had a unique opportunity to spend some time in Havana, Cuba on trip to support the Cuban people. Having been to many developing countries around the world, Cuba was by the far the back of the pack when it came to technology. The internet is uncensored; however, it can only be accessed with timed prepaid access cards in specific areas known as WiFi zones or parks. Internet speed was fine for picking up email or checking Facebook, but was nowhere near good enough for a Whatsapp video call. Additionally, anyone who has ever seen pictures of Havana knows that the streets of Havana have cars made in the 1950’s. While I expected to see many of these cars, I was surprised that these classic cars were by far the majority on the roads. As an aside it can be quite jarring to see a 1950’s American or Soviet car with a 21st century sound system. While the trip is still fresh in my mind, here are my 3 quick technology takeaways. Having constant access to the internet isn’t really that necessary. It was actually kind of pleasant to be in a place where people were not constantly on their mobile devices. In almost everywhere I have ever been in the world, you can’t walk a few feet without seeing someone on a mobile device doing something, but not in Cuba. Except for people using their phones to take pictures, there are hardly any phones to be seen. I only heard a phone ring a few times during my trip, and I definitely didn’t see anyone browsing Facebook while waiting in the long lines to get into stores and banks. In our society, people buy or lease cars every few years. I once bought a used car with 75k miles and was told by the salesman that it had completed ¾ of its expected life. Most cars will survive well past 100k miles, but cars that make it to 300k are true rarity. From an age standpoint, there are hardly any cars on our roads older 20 years old. 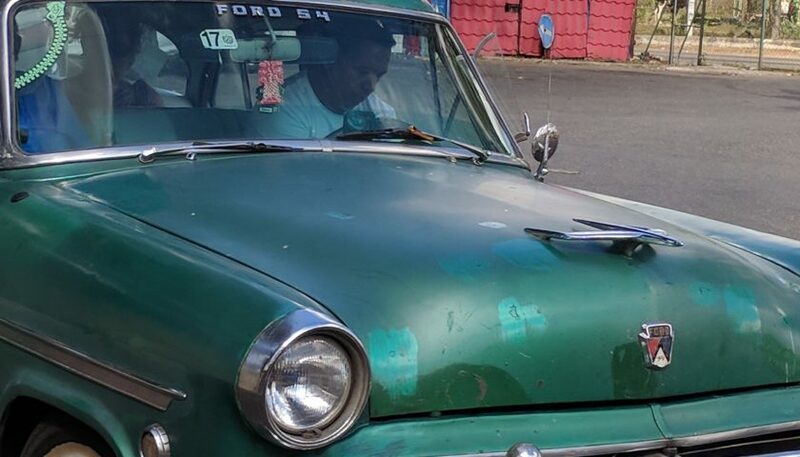 In Cuba, they are driving cars that are 60 years old! They are driving cars made by people who are likely no longer even alive anymore. This got me wondering whether we are too quick to throw things away; especially cars, and maybe with some tender care everything might just last longer. During my travels in Asia, I certainly saw things being sold and reused that would most likely be in a garbage heap in a developed country; however, nothing was as old and complicated as a car from the 1950’s. In many of the developing countries I have been to, it has been amazing to see the transformative powers of mobile devices and the web. Moped owners in Indonesia can now earn an income by joining an Uber like network called Go-Jek, Filipino programmers can supersize their income by broadening their client base through Upwork, and Cambodian tuk-tuk drivers can land customers through Tripadvisor even before they land in the country. In Cuba the impact of the Internet is even more apparent since it is hardly available and minimal progress from slight access shows the potential of the web. The Cuban economy is heavily reliant on foreigners visiting Cuba. Since there are very few actual hotels, many people stay in private homes. Airbnb is available, but it is quite challenging for hosts to run their business with limited Internet access. I can only imagine how much Airbnb-like services would impact the Cuban economy if the Internet was more prevalent. On the same note, Havana is noted for its music scene, but local artists don’t have the same promotional avenues available to them that artists around the world have with social media. It was fascinating to hear artists promote their social media channels with reminders to follow them when Internet access is available rather to just “like” them now. If Cuban artists could build their social media followings like other artists, who knows if might we see and hear more Cuban art. Cuba was generally a fascinating place, but the ability to feel like I traveled back in time made it even more interesting.